Oppenheim made his last trip to the Orient. Little is known of the trip, though the purpose was reportedly to resume his dig in Syria before his permit expired.Still, there are some questions about whether there was more to it than that. The trip was paid for by a special fund administered by Hermann Göring, the head of Germany’s air force and leading Nazi, who collected stolen paintings and antiques from all over Europe.Once back in Germany, Oppenheim lived in Munich, where he witnessed the demise of the Third Reich in person. His finds had been bombed to bits in Berlin, and he had few treasures left to his name. Soon thereafter, in 1946, he died of old age. The news site for the East (short int ) was during the First World War in the Middle East operating unit of the German General Staff and the Foreign Office . She was pro-German propaganda activities in the countries of the East and British Indiaresponsible and fulfilled at the same timeintelligence tasks. With little success, the news agency went to great Islamic faith to move soldiers from the French, British and Russian armies to overflowing. POWs Islamic faith at the instigation of the message body in the ” Halfmoon Camp concentrated “in Berlin.Here Islamic practices such Essgebote or wereRamadan explicitly taken into account and built the first mosque on German soil for the prisoners. “Guest speakers” from Turkey tried to agitate the prisoners and to persuade to change sides. The news agency supported nationalist movements in the Middle East countries to ensure that the German position in the Middle East and Transcaucasia to strengthen and the Entente powers, France , Britain and Russia to weaken. The politicization of the term ” jihad “in the Islamic world is partly due to the propaganda activities of the intelligence agency. The activities of the intelligence agency still impact on the German alliance policy in the Middle East. 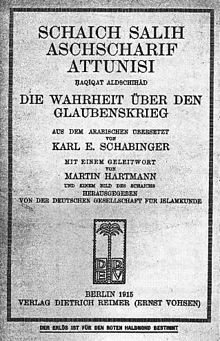 In the national states of Egypt, Israel and Turkey are like during the First World War, the local ethno-nationalist movements important allies, while the Germans ethnically mixed,Francophone and some non-Muslim peoples of the Levant, especially in Syria and Lebanon , suspicious and strange have remained. 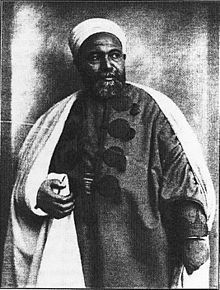 Max von Oppenheim – initiator of the NFO – in Arab dress. The relations between Germany and the Ottoman Empire were at the beginning of the 20th Century very well. While the German military missions provided for a modernization of the Turkish Army, was awarded the prestigious German-Ottoman major project, the construction of the Baghdad Railway remote parts of the multiethnic state, opened up. The rising superpower Germany tried to win in the Turks as allies. The Ottoman Empire was on the ground, however: The European Powers said because of the ongoing economic and political decline of the ” sick man of Europe “. The ” Eastern Question “if persist, the Ottoman Empire and divided as colonies and would disintegrate so was an important aspect in the foreign policy of imperialism . – Max von Oppenheim, October, 1914. The memorandum Oppenheim came to the Under Secretary Arthur Zimmermann to ChancellorTheobald von Bethmann-Hollweg, and Emperor Wilhelm II during the Emperor, to whom much was keen to win the Ottomans as allies, the plan looked benevolently ruled divided opinions in the Foreign Office. In particular, the liberal diplomat and East expert Friedrich Rosen , an opponent Oppenheim, urgently warned not to incite religious fanaticism. However, since theGeneral Staff under Helmuth von Moltke promoted decided the plans in November, the foundation of the “news site for the East” by the Foreign Office and the Section on the Deputy General Staff. This was under the direction of the diplomat Rudolf Nadolny , who since the Ottoman Empire entered the war on the side of the Central Powers on 3 November was responsible for the Cooperation of NFO with the military. The NFO was their status after neither an authority nor a private company. Their secret cooperation with the Foreign Ministry and the General Staff gave her half but official. In the organization they resembled a university faculty : In addition to the line there was a law firm and a press office. There were six divisions, edited legal, Turkish, Persian, Arabian, Indian and Russian affairs. In addition, the editors of the newspaper and the prisoners were New Orient equated the departments. The entire organization was up to the head of the institution, in the early years so Max von Oppenheim. To zoom in close to the Muslim population and to facilitate the work, each native speakers were employed in the departments concerned. The news agency initially sat down “from some long ago with Oppenheim somehow connected persons” together. They were working on a collegiate basis as possible voluntarily and sometimes even free of charge together. The further progress of the war, the stronger the institutional character of the NFO. In 1915, 15 German and 20 oriental people were employed in the message body. There were also occasional translator eleven and eleven other employees. In 1918, the total staff consisted of 59 persons, including several office servant and messenger. The staff were mostly German Orientalists, diplomats or journalists . In March 1915, Max von Oppenheim, the founder and initiator of the news agency, was appointed to the German embassy to Constantinople. For this reason, he appointed his assistant Karl Emil Freiherr von Bingen damage Schowingen indefinitely to his representative.Damage Binger was a diplomat and lawyer, but had already during his studies and developed a strong interest in Oriental Studies at Martin Hartmann learned Persian and Turkish. Until the formation of News saddle point Binger was at the Imperial Legation in Tangier ( Morocco have worked) as an interpreter. With the takeover of the management of the NFO it was the title of “Consul “award. Binger damage remained until 22 February 1916 in the office before he was transferred to the Foreign Office to the German Consulate General in Jerusalem. He was succeeded by Eugene on Saturday. Wednesday was no longer semi-officially appointed by Oppenheim himself, but commissioned by the Foreign Office. Wednesday was a professor of Islamic Studies and directed the NFO until its dissolution at the end of the war. A connection between the German employees of NFO was on the Seminar for Oriental Languages ​​in Berlin. This prestigious academic institution has produced many eminent Orientalists and made ​​for an exceptionally good voice training numerous German diplomat and colonial administrator. The seminar had in the educational landscape held a privileged position and was operated jointly by the German Empire and the Kingdom of Prussia. The funds came from the budget of the Foreign Office. The Department of Oriental Languages ​​in the Empire was a cadre of German diplomacy in the Ottoman Empire and thus for the NFO of paramount importance. 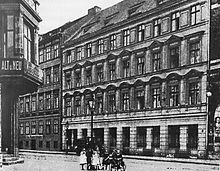 The approximately 20 employees of the news agency oriental tried by a move to the German Empire, that enjoyed a certain popularity in the region to better pursue their own interests: This was a fine line between patriotism and desire for independence on the one hand, and collaboration on the other. The management of the NFO therefore always remained suspicious and supervised the activities of this employee group very closely. The news agency tried to turn in various ways to recruit Muslim operatives. Some came on the recommendation of the Ottoman side, others were from the communities of the Eastern exiles, including in Switzerland, recruited by employees of the NFO. Brochures and books should exert influence on public opinion, especially in the neutral countries.The largest part of the nfo publication was a translation of a comprehensive war chronicle. From 1916 appeared Orient issue of image work The Great War in pictures in Arabic, Turkish, Persian and Urdu. This did not come all the publications written by staff of the news agency. Many texts have been written anonymously or originated by Muslim scholars and were only checked by the NFO for their suitability as propaganda and published thereafter. The influence of the press was another aspect of the propaganda activity. For this reason, Max von Oppenheim in 1916 participated in the founding of an Arabic-speaking, German-friendly newspaper called Al Sark in Damascus. Since that year the Persian newspaper published in Berlin Kaweh in cooperation with the intelligence office. In addition, the NFO called two of their own, official organs into life: the correspondence sheet and the journal The New Orient . Deutsche wiki, trans from Geramn. Karl Emil Freiherr von Bingen damage Schowingen (* September 271877 in Gernsbach , † April 4 1967 in Baden-Baden ) was a German diplomat and orientalist. Damage Binger from Schowingen studied from 1897 at the University of Heidelberg law . During this time he developed a strong interest in Oriental Studies . Therefore, he decided after the completion of his law studies at theSchool for Oriental Languages ​​in Berlin with Martin Hartmann Persian andTurkish to learn. 1901 Binger joined damage of Schowingen in the diplomatic service and was first interpreter at the Imperial Legation in Tangier ( Morocco ). On 22 March 1915 he was appointed Max von Oppenheim his successor as head of theintelligence office for the Orient . In 1916, he became the German consul inJaffa appointed. He had until the end of this post World War stopped. 1918 to 1924 he was in the Orient Department of the German Foreign Office operates.In 1931 he joined the NSDAP in. Eugene Mittwoch (* December 4 1876 in Schrimm in Poznan , † November 8 1942 inLondon ) was a German orientalist. He is considered a founder of modern Islamic studies in Germany and as a major Jewish scholar. Mittwoch initially intended, rabbis and to be graduated from the Rabbinical Seminary inBerlin. In 1899 he received his doctorate at Edward Sachau . His habilitation was in 1905.During the First World War led Mittwoch’s news site for the East as the successor of the founder Baron Oppenheim and Karl Emil damage bingers of Schowingen . After a first job at the University of Berlin in 1915-16 and a brief appointment at the University of Greifswald 1917, he was from 1919 until his dismissal by the Nazi government in 1935 professor of Semitic Studies at the University of Berlin. During this time he also acted as a major Jewish scholars, among others, he was an academic teacher of the legendary “Rav,” Rabbi Joseph Ber Soloveitchik . Was given emeritus regularly that Mittwoch, 1935 and later still received emoluments of the Berlin University, was on personal intervention of Benito Mussolini attributable. Mittwoch was the leading experts Abyssinia in Europe and thus as a scientist working for the military in Ethiopia Italians of considerable importance. Between 1910 and 1930, made ​​Mittwoch young Falasha and was an important member of the Aid Association of German Jews . He served as past chairman of the Society of Promotion of Science of Judaism , and was also Managing Director of the Central Association of German Citizens of Jewish Faith . As one of the first German Jews Mittwoch spoke modern Hebrew . During the 1930s Mittwoch was head of the Berlin office of the American Jewish Joint Distribution Committee . He emigrated to France in 1938 and in 1939 went with his family to London. His mother was killed in the concentration camp Bergen-Belsen. This entry was posted on 02/02/2012 at 12:28 am and is filed under Hitler, Holocaust, Jews, National Socialism. You can follow any responses to this entry through the RSS 2.0 feed. You can leave a response, or trackback from your own site.